Russian Helicopters company CEO said that the first export contract of Russia's Ka-52 Alligator combat helicopters is expected to be carried out in full by 2020. 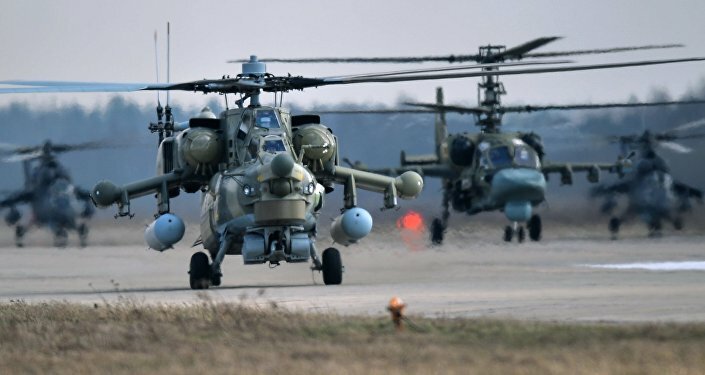 ARSENYEV (Primorsky Territory, Russia) (Sputnik) – The first export contract of Russia's Ka-52 Alligator combat helicopters is expected to be carried out in full by 2020, Russian Helicopters company CEO Andrey Boginsky said Friday. "Within the framework of the signed obligations, the contract is executed within three years," Boginsky told reporters. "We must supply the first helicopters in the summer of 2017." He said the contract envisions the terms of delivery and training of a foreign buyer's specialists. The Ka-52s are manufactured by the Progress Arsenyev Aviation Company, part of State Corporation Rostec. Mass production of Russia's Ka-52K Katran shipborne attack helicopters is planned to start in 2020, Russian Helicopters company CEO said. "I think it will be closer to 2020. The volume of improvements is substantial but we are ready for it," Boginsky told reporters.